In part 3 we finished logging the daily information in the PLC. We will now log minute by minute information in the PLC memory for retrieval. Similar steps will be taken, but we no longer have to track shift by shift information. This is where the amount of memory used in the controller can be great. 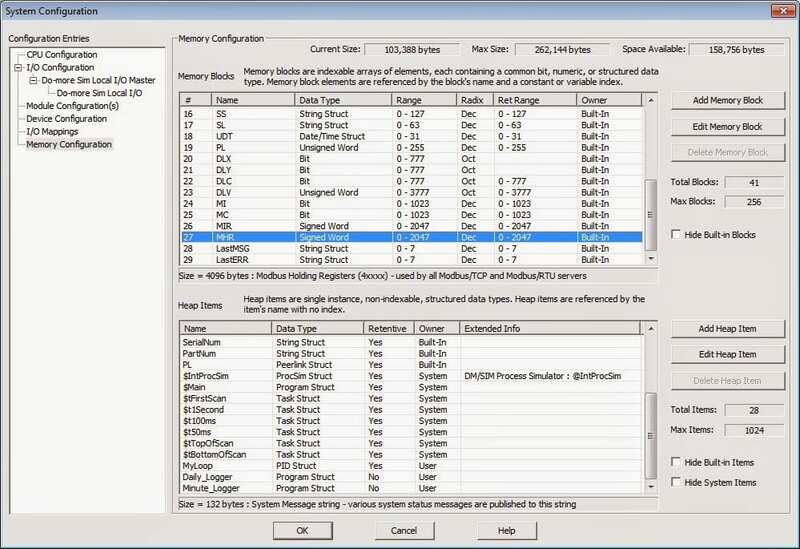 The Do-More PLC will allow you to allot more memory to areas in the configuration menu. We will leave this at the default setting in our project. Remember that this can be modified at any time if you wish to increase the amount of information logged. 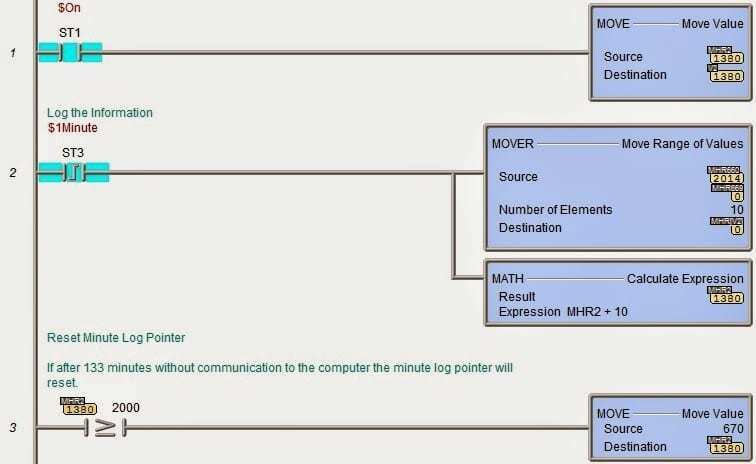 We will start off by looking at the log pointer. MHR2 = 670 means that we are all data has been retrieved. MHR2 = 2000 means that we have 133 minutes of data to be retrieved. 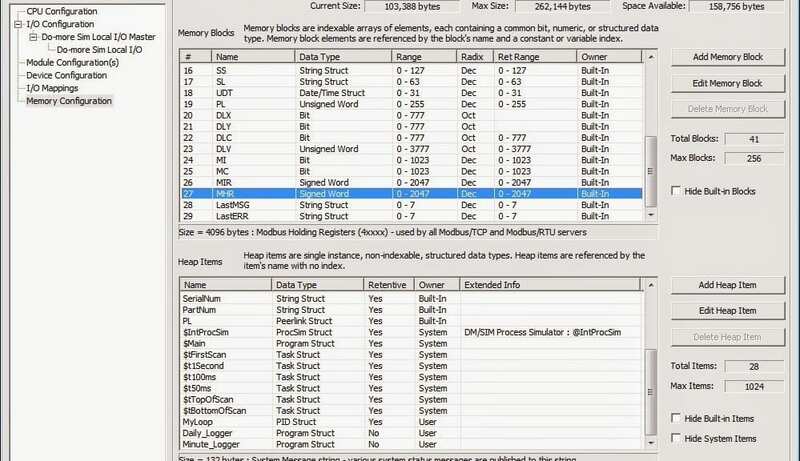 A visual basic program will read MHR2. If it is greater than 670 then the data will be read and then written into a database. It will then write the value of 670 back into MHR2 to reset the pointer. After 133 minutes (~2 hours) without communication to the programmable logic controller, the data will be lost. You may wish to increase the memory area as mentioned above. 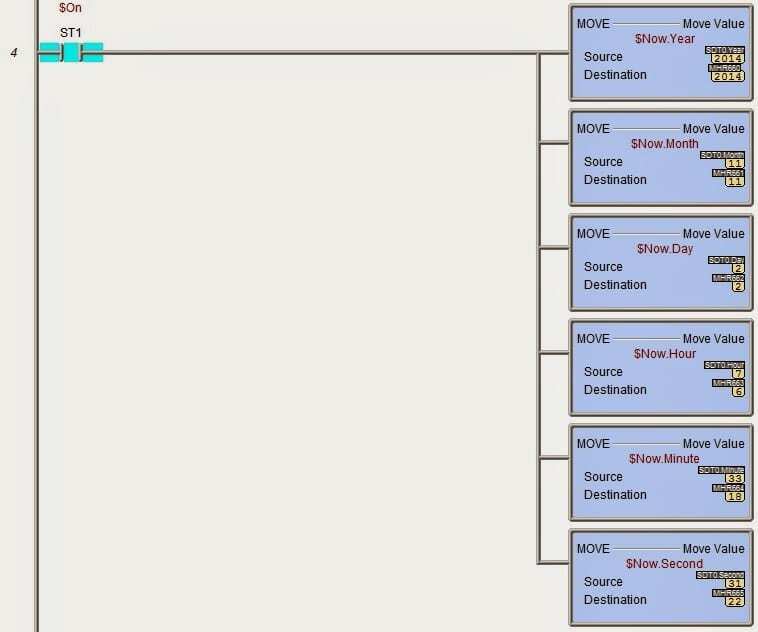 This will change the MHR area so your reset value will have to change from 2000 to your new setting. This area sets up the real time clock. (RTC) The format is as follows: YYYY MM dd hh mm ss. For testing purposes a 50ms internal timer is used. The count input should be activated on the leading edge if you remove the 50ms internal timer. With each pulse of the input, D40 increments by 303. There for after 10 pulses the value in D40 will be 3030. This would represent 3.030 meters of product. To change this into an integer to log the data we will divide D40 by 1000 and store the result in D41. Using some math we split our total meters into the most significant 4 digits and the least significant 4 digits. D41 minus ((Int(D41/10000)) *10000) will be placed into MHR667. Samples are taken once per minute. If the current meters is greater than the last minute meters then subtract the last minute meters from the current meters and store it in the meters passed since the last minute.If not do the opposite. This will ensure that a negative number is not obtained. 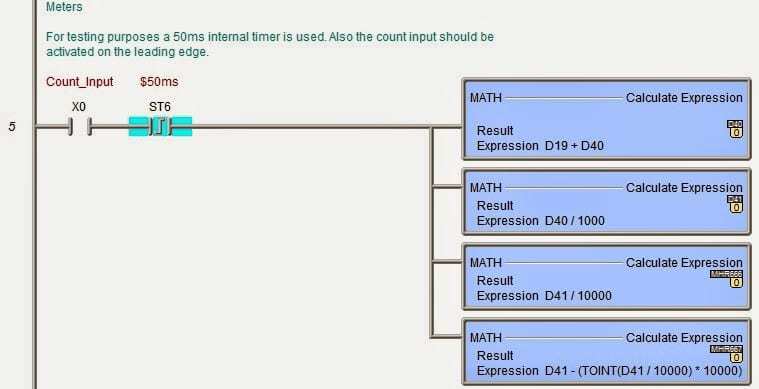 The meters passed since the last minute are then divided by 1000 so we are only looking at the integer of the number. 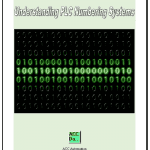 This finishes the PLC programming. 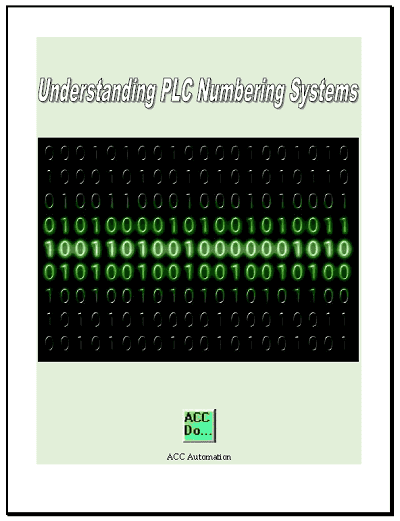 In part 5 we will continue by getting the information out of the PLC. To get a copy of the entire program. Please contact me in the contact section. I will be more than happy to send you the program. Put ‘Robust Logger’ in the subject line.